For some time now, Ive been really interested in getting a small 9mm revolver for cheap range plinking. Last Jan, I picked up a used .44 spcl Bulldog (2016 build) and really fell in love with the little guy. It is what it is, but with the sub $400 I paid for it, Im more than pleased. Sadly, the little guy is a handful and getting my wife to shoot the thing is a no-go. On top of that, I dont reload (yet), and 44 spcl is far from cheap. Enter the Bulldog. 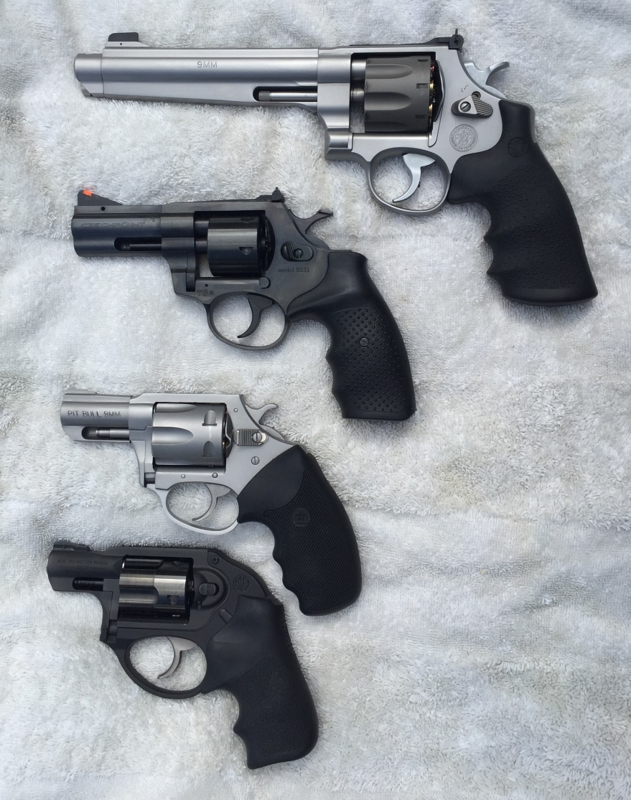 I know Ruger makes a LCR in 9mm as well as the 9mm SP101 they re-introduced...but neither are all that cheap (and the SP101 is near impossible to find locally). To add to it, Im pretty sure both use moon clips and while Im not afraid of them (I own a 627 that takes them), I dont want to mess with them on the reg. I had been looking for a Pitbull locally, but no one had them. Monday while out of town for work, I wandered into a local Big R and noticed they had a new Pitbull on sale for $379...I snatched it up. For those that dont know, the original Pitbull was a 6 shot and by what Ive read, they had some issues with the cylinder device they made to get around moon clips. If you search for reviews online, nearly all of them are on the 6 shot models. Not all of them are glowing. Not too long ago, Charter redesigned the Pitbull and took it down to 5 rounds. By what I understand, the 5 round design is far better. Long story short, I took it out today with some 115gr Perfecta, 115gr Federal bulk, and some 124gr Blazer brass. The Perfecta was difficult to extract for some reason and the first 3 cylinder full sessions locked up on me. (Opening and reclosing the cylinder would fix it and the other 75 rounds ran just fine). The Fed and Blazer extracted perfectly and the pistol seemed to like the 124gr best. Loading ammo in the cyl is a breeze as well, you just push them in and they pop in place. Finish wise, the revolver is a bit rough so Ill need to smooth out the metal in a few spots so it doesnt rub my hand raw. Fit is great, it feels solid and everything works as it should. Cyl timing is spot on and the barrel isnt canted. Besides that, the recoils is VERY manageable and the pistol is just plain fun to shoot. DA is stiff but smooth and just like my Bulldog, will smooth out in time with ample dry firing. Funny enough, it weighs in at 22oz vs the 19 the Bulldog weighs. In the end, for $379 + the silly cheap cost of 9mm...this guy is going to be a fun and affordable addition to my range sessions. Edited by smokehouse, 11 August 2018 - 11:58 AM. Cool. Thanks for the review. I'd like a 9mm revolver but don't like moon clips. This interests me. Keep us updated on the range time, please. I've had a Charter Arms 9mm PITBULL or a while, and it is fun to shoot. I actually like moon clips a lot better, especially when I have limited time at the range, or if I happen to be at a range that charges by the hour or something like that. I can load up a mess of moon clips ahead of time and I don't have to spend so much time loading the revolver. Even if I have to load the clips from scratch I think its faster to load a mess of clips with a moonclip tool than put each cartridge in the PITBULL's chamber. You probably have the 5-shot revolver right? I purchased the original PITBULL that holds 6 rounds. I haven't had problems ejecting decent ammo - it does not like aluminum or steel cased - but I haven't had any problems with regular brass ammo. I like the 6-shot version. I have a old Ruger something with a 9mm and 38/357? changeable cylinder, no moon clips, it's a nice revolver if you can find one. If I could find it myself might be a challenge, I should look it's going to bug me now.